Two capillary tubes with the diameters of 0.1 mm and 0.3 mm are immersed by one end in a vessel of water at 20° C. How will the difference between the height of water in each capillary tube change, if we heat the water up to 70° C? First of all, we need to think about the quantities, on which the height of water in capillary tube depends. On one hand, it depends on the diameter of the capillary tube; water will rise higher in a narrower tube. On the other hand, height of water also depends on surface tension. However, surface tension of water varies depending on temperature; when temperature increases, surface tension decreases. Density of water also depends on the temperature; after about 4 °C it also decreases, when the temperature gets higher. So, height of the water in capillary tubes will change after heating the water. Change of the diameter of the capillary tube during heating the water will not be considered. First, we determine the height of the water in both tubes at 20 °C. After that we calculate the difference in the height of water in these capillary tubes. Similarly, we determine the difference in the height of water in both capillary tubes at 70 °C. Finally, we calculate the change in the difference between the height of water in each capillary tube in case of the given change of temperature. To calculate the change of the difference between the height of water in capillary tubes, you need to know what relation for the height of liquid in a capillary tube. 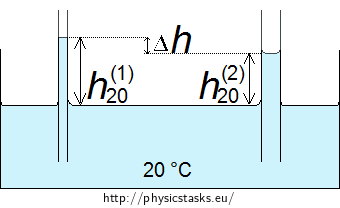 The values of surface tension of water at different temperatures can be found in the Tables or on the internet. where σ is the surface tension of the liquid at the given temperature, r stands for the radius of the capillary tube, ρ is density of the liquid and g is gravitational acceleration. Note: Derivation of the relation for the height of elevation of liquid in a capillary tube can be found here: Capillary action between glass plates. Nejdříve určíme vzdálenost hladin v kapilárách při teplotě vody 20° C.
Výšku hladiny vypočítáme podle vztahu (1). Povrchové napětí σ a hustota kapaliny ρ závisí na teplotě, proto budou mít tyto veličiny ve spodním indexu zapsanou teplotu kapaliny. If the temperature changes from 20° C to 70° C, the difference between the height of water in the tubes will change by approximately 2.1 cm. An experiment that corresponds with this task can be found here: Height of Liquid Level in Capillary Tube.